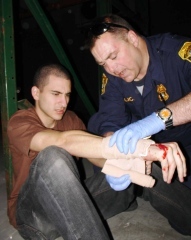 Improve your skills in learning how to assess and immediately manage common life‐threats and traumatic injuries. Concepts are based upon the military model of Tactical Combat Casualty Care (TC3) and the most current information and case studies from the United States military’s Special Operations Command (SOCOM). We have offered this course to police, fire, and EMS professionals across the country for several years.